For at least 5,000 years before English settlers arrived in Newport, Native American peoples lived here. By the 17th century, they had a sophisticated culture with extensive land management and fishing communities. It was their efficient land clearing in what is now downtown Newport that made this area so appealing to the English settlers. The second oldest Jewish community in the United States is centered in Newport. Jews who fled Spain and Portugal during the Inquisition settled here in 1658, and today they worship in the oldest synagogue in the United States. The Touro Synagogue, built in 1763, is also the only American synagogue dating to the country's Colonial era. In 1876, the first polo match in the United States was played near Newport. The New England seaside resort town of Newport, Rhode Island boasts one of the largest concentrations of colonial era structures in the United States. It is famous for hosting the prestigious Newport Folk Festival and Newport Jazz Festival - two of the most important music festivals in the world - as well as for its historic Gilded Age mansions and its vibrant waterfront area. There are numerous hotels and resorts, mostly on a smaller more boutique scale, and vacation rentals available for accommodation. There is excellent fishing here, and the town is also one of the major yachting centers in the United States. It is little known that Newport was a major player in the slave trade during the colonial era and up until 1807, breaking numerous state laws in the process. Fortunes were made, and these slave merchants built grand homes that were the precursors of today's famous Gilded Age mansions. Beginning in 1839 with the construction of Kingscote, a number of wealthy plantation owners from the South began building what they called summer "cottages" in Newport. Wealthy Yankees who had made fortunes in trade with the Qing Dynasty in China also built their mansion-like cottages here, including Chateau-sur-Mer in 1852. In the latter part of the 19th century, some of the richest families in the United States had built luxurious French neoclassical and English Tudor "cottages" in Newport. The Breakers was completed by the Vanderbilt family in 1895. Hammersmith Farm, completed in 1887 by the Auchincloss family, was Jacqueline Bouvier's childhood home and where she married John F. Kennedy, and it was known as the "Summer White House" during his presidency. The 27-bedroom Miramar (with a wine cellar accommodating 10,000 bottles) was completed in 1915. 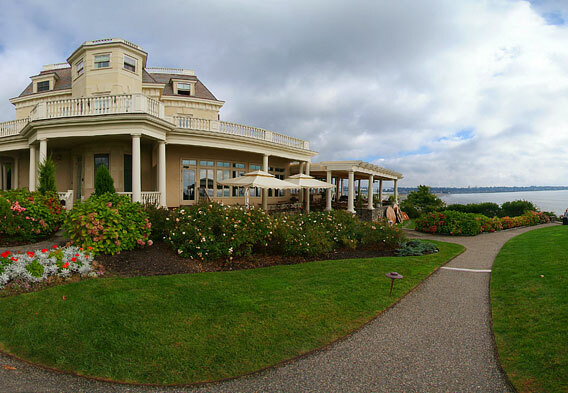 Many of the Newport mansions are still privately occupied - others are open to the public for tours and special events. Newport has always been a seafaring town. It was a major port city during the 18th century, and today is the home of the US Naval War College, the Naval Undersea Warfare Center, and is a US Navy training Center. Many consider it the yachting capital of North America, having hosted the prestigious Americas Cup and being home port for many of the contenders in that international sailing competition. 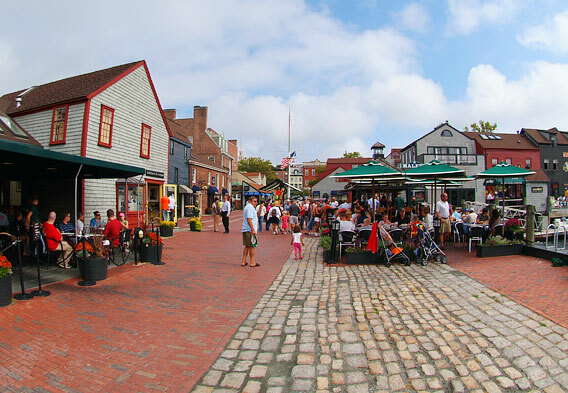 Its waterfront and harbor provide some of the town's most important attractions, including charming boutiques and other shopping venues and great dining spots, many of which are located in or near historic colonial-era buildings. The Newport Cliff Walk is a National Recreation Trail that begins in the Historic District and runs for 3.5 miles along the Oceanside cliffs past majestic ocean scenery and some of the famous Gilded Age mansions, including Beechwood that was the Astor summer house. It also passes Marble House, Rough Point, and the Breakers that were built by the Vanderbilt fortune. Also along the walk is the "40 Steps," a stone staircase that descends dramatically down the cliffs to just over the water. From Bailey's Beach to Rough Point, the trail is an easy walk. After this and on to the end of First Beach, it is more difficult, requiring some scrambling. 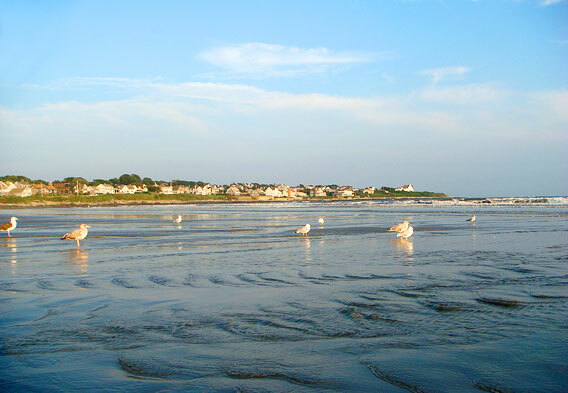 While many of the beaches in Newport Rhode Island are private, there are plenty of stretches of sand and coast available to the public. Some of these are within easy walking distance from the downtown waterfront area, including Easton's Beach (also known as First Beach), Sachuest Beach (SecondBeach), and Navy Beach (Third Beach). You can also visit beaches at historic Fort Adams State Park or take the ferry to some pristine and secluded Block Island beaches.